Just finished piecing the centre panel for the Improv Quilt. I’ve cut some strips to widen the panel another 4″ to balance out the length. I’ve also cut strips for the borders. Yesterday I bought some backing fabric and I’m planning on using the golden leaves for binding. Because the piecing is random and bold and busy, the imperfections don’t show (only an eagle-eyed quilter would notice them) – there’s just the sense of shapes and colour distributed throughout the panel. With the strips and borders added the size and continuity will be fine for a good size lap quilt which is what I was aiming for. 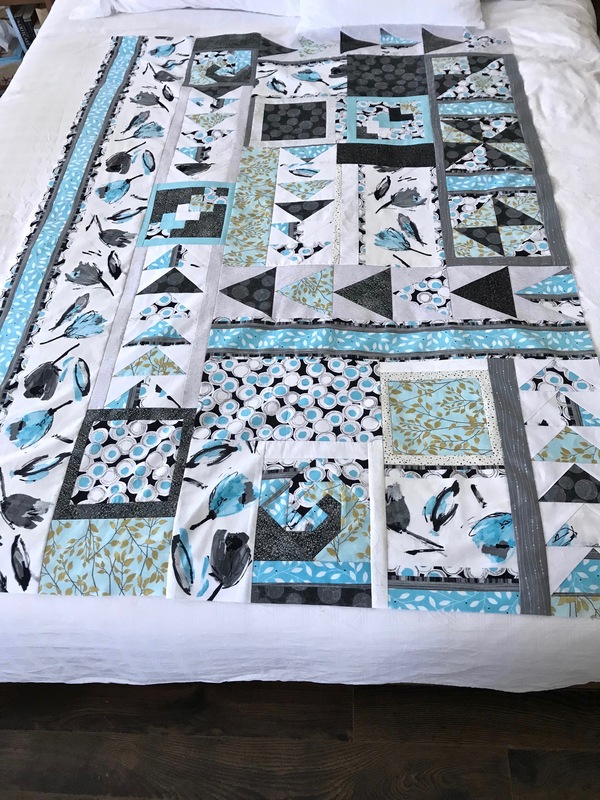 Once I have the top completed I still have to piece the backing and assemble the quilt sandwich – all before Tuesday, when this class meets again! So I’m under a bit of pressure to keep moving this quilt along. Been ‘stealth’ following for ages Judith and love to watch your quilts come together. I quilt – but nothing as adventurous or artistic as yours. I’m also a sock knitter so I like to see all your sock posts too! Welcome to the conversation, Lynne.